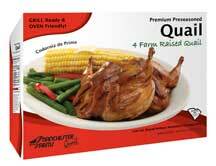 Try any of our BEST selling quail combo packs. Order online today! To order items below individually orders must be placed by calling ……to determine the best freight rate. All orders are shipped via Fedex, and are packed with dry ice. Shipping will be determined by weight of package and destination. Orders will be shipped Tuesday or Wednesday. All bones have removed from the bird except the wing and leg bone. Available natural or marinated. 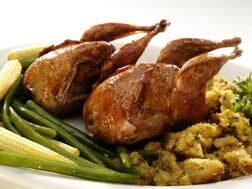 Marinated quail is vacuum tumbled in a simple brine seasoning to tenderize the bird and help lock in moisture. These Quail are fitted with our signature “V” pin which helps maintain its shape during preparation. 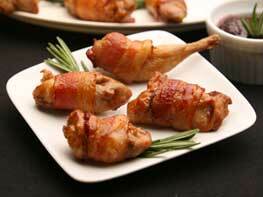 Perfect for appetizers, our quail knots are a half quail breast with a drumstick. 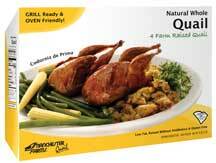 Our semiboneless quail is split down the middle, leaving a wing, breast, and leg with drummette. Available whole, breast cut down the middle leaving the backbone intact, or spatchcock style; comes natural or marinated. This is one of the 2 newest additions to our quail line. This Bacon Wrapped Quail Breast is completely boneless. The quail is marinated before being hand wrapped and individually frozen. There is no toothpick so it must be baked, grilled, or fried FROM FROZEN in order for the bacon to not fall off. This is one of the 2 newest additions to our quail line. This Bacon Wrapped Quail Leg has the thigh bone removed so the first bite is boneless and the only bone left is the drumette which acts like its own little handle. The quail is marinated before being hand wrapped and individually frozen. There is no toothpick so it must be baked, grilled, or fried FROM FROZEN in order for the bacon to not fall off. Learn more about quail eggs.